I love doing all my tricks with Mommy. She's my one and only trainer, and has been all my life. Mommy has always been so positive, encouraging and fun to work with that I love to make her smile, laugh and be happy with all the interesting tricks I can do. I look at my training as a team effort, because I am after all half of the team. But how did my trick learning all start? And what is Mommy's technique? When I first adopted Mommy, she was in her last semester of college as a non-traditional student (she was much older than everyone else) and had a tiny little apartment near the school. She had no kitchen table, so she would often eat dinner on the couch while watching a little TV before studying or working on projects. I would sit next to her at the tender age of around 3 months old or so and try to get her to give me food by swotting my paw at or on her plate. I made a bit of a mess a few times, let me tell you. She kept telling me no or stop or whatever she would say, but I often kept doing it, so she'd put me down on the floor to make me stop. Mommy really wanted me with her on the couch though to be near her and visit, so one day the proverbial light bulb went on, and she suddenly thought, "What if I turned that bad behavior into a command or trick?" 1. She trained OUT of me the bad behavior with positive reinforcement. 2. She trained into me my very first command or trick word. Eventually, "Smack" became about five different tricks, each with a different word. I promise to go into how you can expand one trick into several in another Positive Pet Training post. But you have to start with one, and master it. Then you can expand. Several of my tricks are actually behaviors or actions I did on my own, and Mommy "reverse trained" me by turning them into commands that I can now do instantly with one word or phrase. 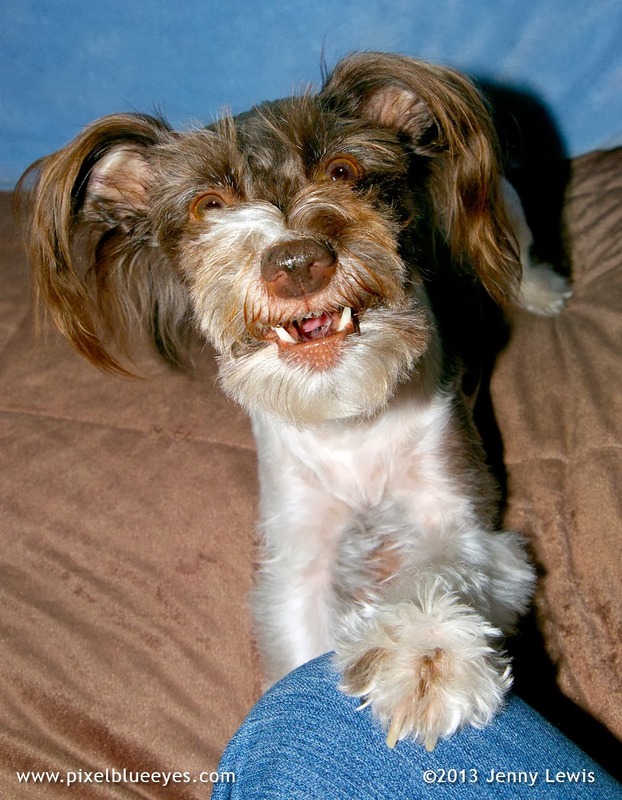 My most beloved trick, of course, is my toothy smile. 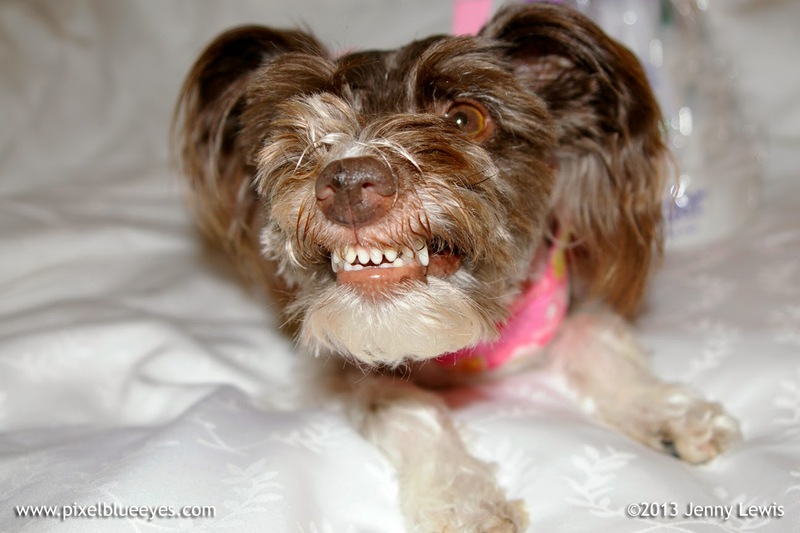 Mommy came up with the word "Sneer" as my code word. It was a trick that Mommy helped me master because I did it naturally. I just needed guidance with doing it on command. 1. Choose one word or phrase for each trick/command and do not deviate from it. Always use the same word/phrase. 2. Keep sessions of learning short and fun. No more than about 5-10 minutes, though you can do it several times a day if you wish. 3. When first starting a new command, be patient when they don't get it. And if they even a little bit start to do it when you say the word, immediately give the treat and the good dog praise. You can fine tune the correction and finer details of it later, but they need to know they are succeeding early on so they keep trying. 4. 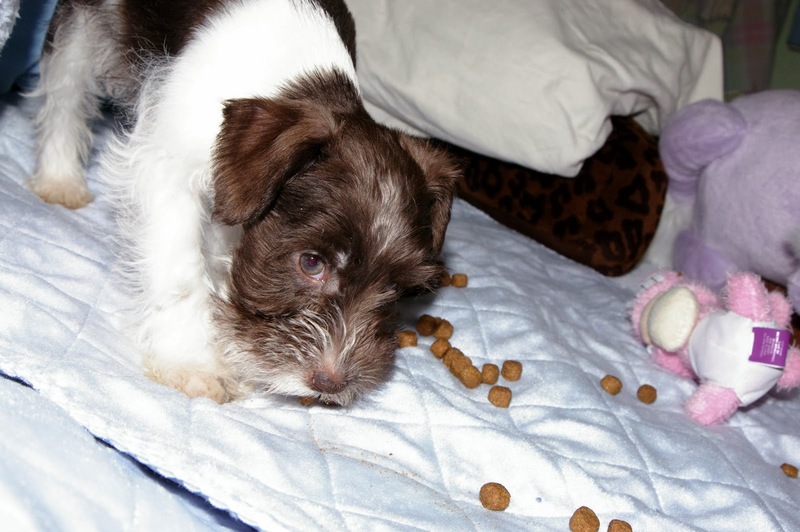 Use tiny little bitty treats, so your dog does not get chunky from learning. Mommy has used gluten free rice cakes that can be broken up into very little pieces, or Rice Chex. You can also use one or two dog bones smashed up into tiny pieces (a ziploc bag and a mallot works wonders). The crunch is great for us pups, no matter how small the piece is, and there's hardly any calories. 5. 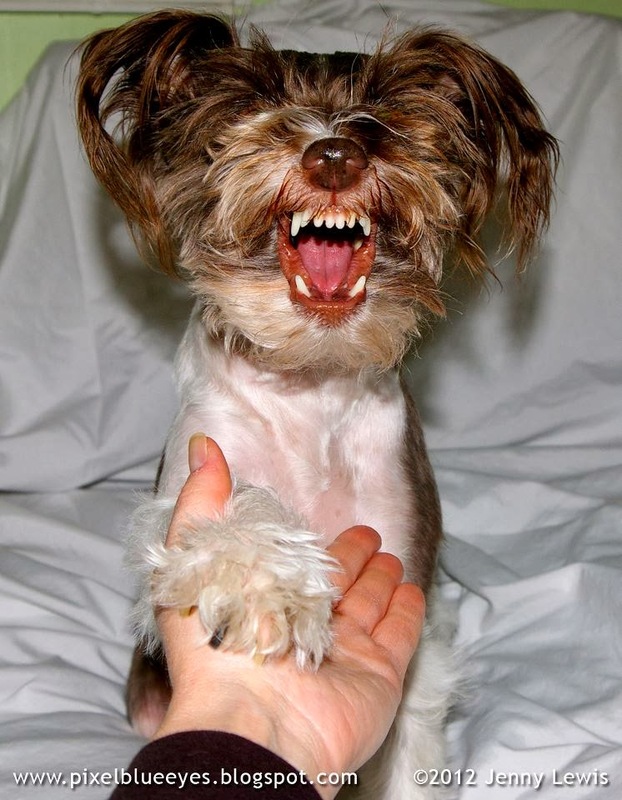 If frustration creeps in during training from either you or your dog, stop and do something else. Play a game of pull toy or run around the yard. Always keep it fun with no stress. 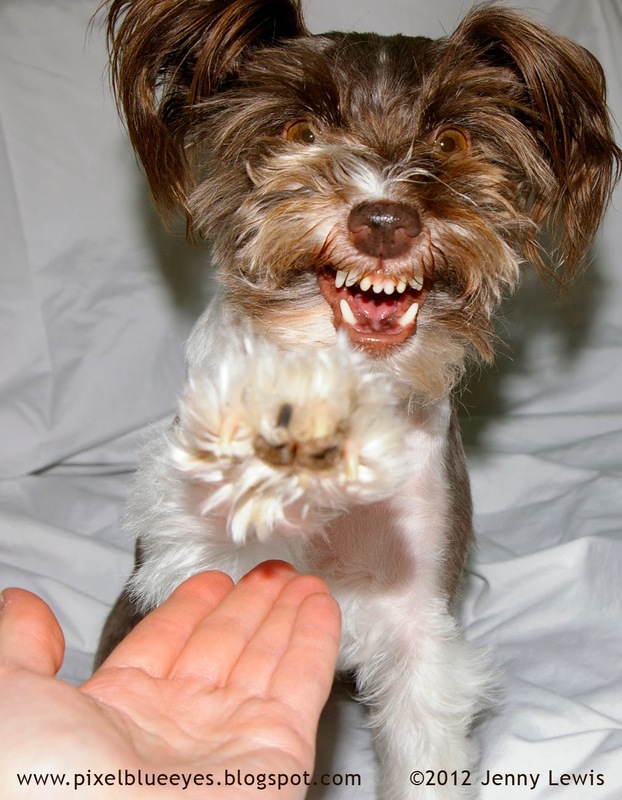 If the dog thinks they are "in trouble" they can get frustrated and either lose interest or become insecure. Some tricks take longer to learn than others. It depends on the dog, it depends on the trick, and it depends on the consistency of the training. Mommy believes it also can depend on the history of the dog. It took me over two years to learn the safety word "WAIT" with Mommy. Wait" means "stop doing whatever you are doing and freeze so Mommy can pick you up". It can save a dog in many instances, including stopping them from eating something bad for them, making them stop in their tracks as they are running towards the street, or perhaps prevent them from stepping into a freshly broken glass of milk that fell to the floor. For some reason, I thought I was going to get punished with that word and what it meant, so I would run away from her every single time. I would even cower when I finally DID stop running away, etc. Mommy always made sure that once I stopped and/or let her pick me up, it was always such a positive response from her. She'd never punish me for not listening, or not "waiting". She just ensured that when I finally waited, I was praised, reassured and loved on. She just kept working with me on it until I truly mastered it. She never gave up, never got mad at me, but was firm in her "WAIT" voice. Now I do it right away, and I still get all the praise and loving hugs in the world after I do it. If Mommy and I can succeed with positive pet training, you can too! It can take a while, but the rewards are incredible! Now that I have so many cool tricks, I sometimes like to give Mommy 2 or 3 tricks at a time, just to keep her laughing. Now, go have some fun with your dog. Learn together, laugh together and remember, always keep it positive! Here is one of many videos that Mommy and I have made of me doing my tricks with her. You can tell we both have such fun! Go to my YouTube channel to see more amazing Pixel pet trick videos. And don't miss my "How does a car go?" trick video either! You'll be laughing so hard just like Mommy is in the video. 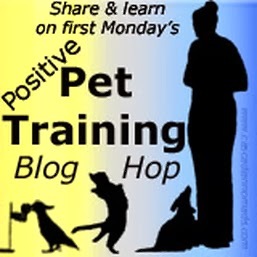 This "Positive Pet Training" blog hop is hosted by Cascadian Nomads, Dachshund Nola and Tenacious Little Terrier. Visit some of the participants below to see how they train their pets in a positive, fun way. Oh my goodness, I am honored that you thought of me and my twirling while working with your beautiful Delia! It might take a while but keep at it. 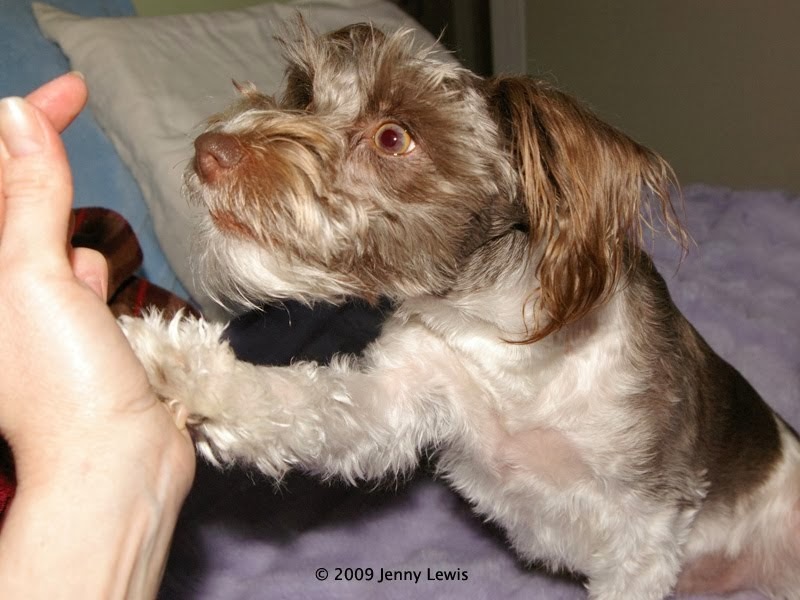 Sometimes twirls can start with doing circles on all four paws, using a treat to "guide" the action of twirling. Basically, have her follow your hand with the treat in it, say the command word you've chosen (mine is "twirl") and when she follows your hand to make a "twirl" then say "good girl" and give a treat. I hope that makes sense. Just have fun with it and eventually it will happen. Thank you for reading my blog and enjoying it and the videos. Love you both!! Your video is adorable! Pixel, you're so sweet! My mommy is a gentle trainer too. I am glad your mommy uses such wonderful teaching methods. How is your weather Pixel? We keep having snow and ice. It makes it hard to play silly outside. Thank you for the kind compliments on Mommy's training. She is indeed a gentle trainer, as I know your Mom is too. I would love to hear any of your Momma Jean's training techniques anytime she wants to share. Our weather has been cold and snowy, but crazy as it may seem, we like it! Mommy & I love the snow! Hope it warms up so you can go outside more though. We are up to our ears in training with Bailie in obedience school and Bailie and I in nose work class. We love training and have done lots of training as a family which is even more fun. Those treats really are great! You can catch a video of my sisters and I training together in this recent post http://mygbgvlife.com/2014/01/31/train-your-dog-challenge/ Love you Pixel! Oh my goodness, I bet you ARE up to your beautiful long floppy ears in training. Training as a family is wonderful! And I adore the treats too...such incentive is very motivating. Going to watch the video right now Emma. Love you my friend!! 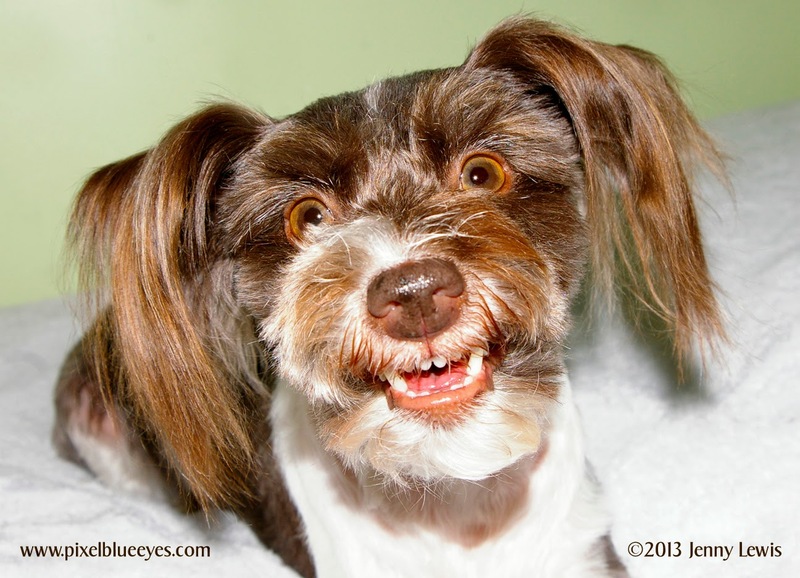 Oh Pixel I am jut thrilled that you shared this story in the Positive Pet Training Blog Hop! (Sorry it took me so long to hop by; I've been sick and am WAY behind.) This is all such great advice. What a very lucky pup you are to have such a smart and patient mommy. Turing an unwanted behavior into a wanted one is the very best training game of all! I hope you'll join us again in March. Hi Bethany, Jason, Wilhelm, Brychwyn, Huxley, & Amelia and Leo! I am so happy I was able to be a part of your new Positive Pet Training hop! Positive training has (obviously) been a big part of our lives together, and I love being able to share it with others. Many people have asked how I know so many tricks, so this is a great way to share! We will definitely join you again in March. Hi Sugar! I'm so happy to hear that the video made you smile. I do love doing my tricks with Mommy Jenny. Thank you so much for coming by to visit. I hope you are having a great week! Awesome video!! Really you have done a great job. Thanks for sharing. Thank you so much Gary Wilson! I am so glad you liked it and appreciate your compliment immensely. We have worked very hard, but only all in fun, to achieve the joyful trick success that we have thus far. Come back and visit anytime! Great blog, as always, Pixel.....I am going to start with some of your easier tricks soon...I think it will be fun for me and Sweet Pea to do some of them! I like the car sounds video too! I have to figure out how to get Sweet Pea's "sneer" to be a trick - she only does it when she's excited for me to be home from work...wish us luck! !